What Did O.J. 's Legal Defense Team and Genesis' Yahwist Have in Common? "If the glove doesn't fit, you must acquit!" It's catchy and memorable; it MUST be true, because it rhymes and it's clever. However, this line of reasoning is well-known and even given a name in the World of logic and contemporary rhetoric: it's the fallacy of "style over substance" (also known as: argument by slogan [form of], cliché thinking - or thought-terminating cliché, argument by rhyme [form of], argument by poetic language [form of]). Description: When the arguer embellishes the argument with compelling language or rhetoric, and/or visual aesthetics. neither exonerates nor inculpates of the crimes. That's true, of course (and NOT because it rhymes! ), since guilt is determined by evaluating the actual evidence, and not relying on some catchy slogan that compels the jurors to reach a hasty conclusion. In the case of the O.J. defense, there are many ALTERNATIVE explanations for why the glove didn't fit, eg shrinkage of glove and/or swelling of O.J. 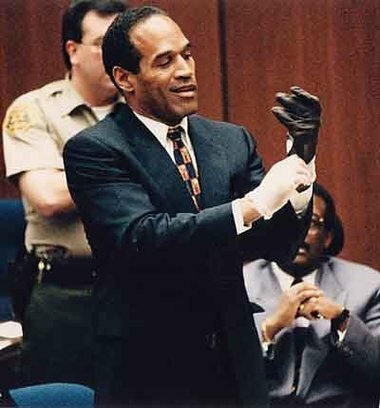 's hands, his failure to even TRY to put the gloves on during the trial (rather than acting like they don't fit), tampering with the evidence by altering the glove's lining, considering that it may have been planted as false evidence (where O.J. may have placed the blood-splattered glove in the crime scene to cover his tracks afterwards), or even HOLDING the glove wrapped around the murder weapon's handle since it also didn't fit before he committed the murder (and not surprisingly, it also wouldn't fit during the trial). The glove wouldn't be expected to fit if any of these factors were in play. Cochran's catchy slogan also creates a false dilemma, as if those other possibilities don't even exist: in his World, the trial can be reduced to an overly-simplistic 'if/then' decision. Worse is, the jury seemingly fell for it. The "style over substance" fallacy fools MANY people, and is used by types like Rev. Jesse Jackson, who knows the ability to come up with clever rhymes means many people will believe the slogan to be true (when the actual saying should be, "if a saying is clever, it must be challenged forever"). The obvious counter-example is the case of rappers: we don't believe what Jay-Z or Kanye West say is always true, simply because they rhyme, right? That's the entire ART of poetry: having the ability to create rhymes. It's not any guarantee of truthfulness, and in fact it MAY be the opposite case, where falsehoods are stated simply BECAUSE the words rhyme. The Yahwist redactor of Genesis was also known for frequently engaging in a love for word-play and relying on the rhetorical power of rhymes, where some examples are still obvious today, eg the Tower of Babel story contains word-play that's still visible in English: the modern English word for unintelligible speech is "babble", and thus shows a not-so-subtle jab at the captors of the Jews, the "Babylonians". Just as in Hebrew as in English, the words rhyme. Unfortunately, many more examples of the Jahwist's love for rhyming in Hebrew have gotten lost in the translation into English, and few people realize that the names of the first man (Adam), the ground (Adamah), and blood (Dam) all are based on similar examples of word play, offering the connection that drives the Genesis narrative using words which convey an element of "redness", being forms related to the words adom (red), admoni (ruddy). Most obvious being, the red color of blood (dam). In the account of Adam's creation, a recurring motif first appears where the first man is fashioned from the red clay of Earth (Adamah), which is where he gets his name (Adam). God curses the Earth to be non-productive for Adam, who's punished by being estranged from the Earth from which he is made. Cain also has the ground cursed for his punishment, and the ground itself even cries out to YHWH when it tastes Abel's human blood (Dam) in its mouth. All of these examples display a complex interaction amongst the mankind, blood, and the Earth (to which animal blood is fed in it's mouth, and covered), ALL based on their rhyming. These interaction play a role in explaining the meaning of Noah's name, where his father Lamech named him nûaḥ, "rest", which is connected to the liberation from God's curse of the ground that Noah secures on behalf of all mankind after the Flood. So Noah lives up to the promise announced at his birth: Noah has obtained "comfort" and rest from God's curse of the Earth, where God promises to never again curse the Earth on account of the evil acts of men. It explains why Lamech (son of Methuselah) needed comfort from his curse, in the first place: like Cain long before him, Lamech had killed two others, and even bragged that God would protect him 77-fold vs Cain's 7-fold protection. After the Flood, God FINALLY announced that rather than protecting the murderer(s) as a display of His merciful and forgiving nature, he'd actually enforce his newly-crafted "no bloodshed" law. Mercy didn't work! ALL of these examples show the intricate interaction based on the Yahwist's fascination with the fallacy of "style over substance" rhyming, even though the connection between the three words is absolutely lost to most modern readers, who instead view the entire story as a more-complex and mystical narrative than it actually is. Johnnie Cochran and the Yahwist in Genesis both shared a love for creating logical arguments that rely on clever rhymes instead of sound reasoning, both allowing the truth of the matter, the FACTS, to be put in the backseat as if a secondary concern. It's a reliance on logical sleight-of-hand, a desire to be seen as clever, and not concerned with reasoning. And as out of left-field as the Genesis narrative may seem to many, it's actually a commonplace tale in ancient cultures, being highly derivative of older Babylonian creation mythologies. So while on the one hand Hebrews hated their captors (and wanted to dash their infants against the rocks! ), they also didn't mind 'borrowing' elements from their-much older mythology. Your challenge (if you choose to accept it) is to study the Marduk story, and see if you can find the similarities between the characters and details of the Genesis account and those of Babylonian mythology. Pay attention to how the waters are divided, the role of the mouth, etc. Think about what the "work of the Gods" might be, the reason that mankind was made (here's a hint: the Gods want to be worshiped). Then ask yourself: if you were sitting on the jury for O.J. 's trial, would YOU be fooled by Johnnie Cochran's clever play on words? Would you be fooled by word-play that is lost on you, since it appears in a story written in a language you don't even speak? Click to Comment on Article!